For a long time I had wanted to try this platform called Node-red created by IBM, it was developed in nodejs, Node-RED is developed by Nick O’Leary and Dave Conway-Jones thanks for your contributions. of things, has a friendly web interface, contains a variety of basic and complex IoT functions, there is also an online version of Node-RED called IBM Bluemix . 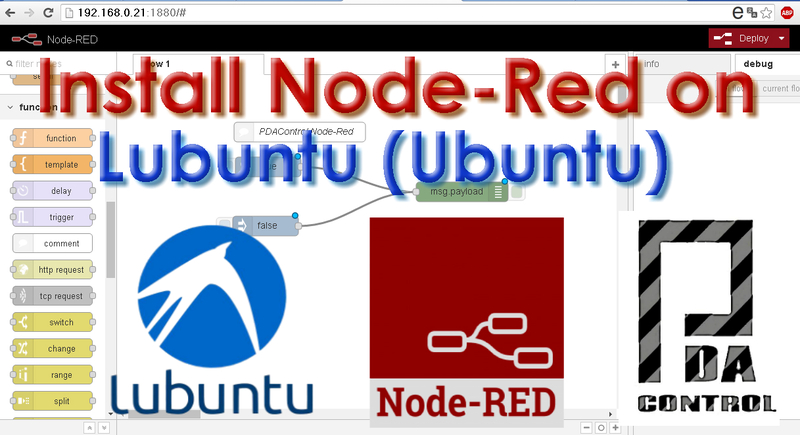 There are a variety of tutorials to install Node-RED on a local server, but these tutorials, although very complete, did not work correctly for me, I have decided to compile the steps to install Node-RED on Linux, in this case Lubuntu ( (Ubuntu) I hope it will be Your liking this guide. Currently they install Node-RED in Raspberry pi, excellent, although since I will perform tests I decided to install it in Lubuntu (Linux) for hardware robustness. I have updated this post, with a new method for the installation of Node-RED in linux operating systems, or installation of virtual machines with linux over virtualbox, This new method allows to obtain the new versions of nodejs and npm, additional facilitates the configuration of Node -RED as a service, automatic start. For the realization of tests I have previously installed a virtual machine with lubuntu, through the SSH putty client equivalent to a command terminal. Ready to have fun …..